Had the best stay at Algarve Surf Hostel, the people are so lovely and the vibe is so happy and chilled. Leah and Johanna who were running the hostel are so amazing, great at cooking and caring for the whole surf family. Would recommend staying here! Stayed with the crew in Lagos for 7 days and loved every part of it. The hosts are incredibly nice, accommodating and genuinely interested in helping give you the best time during your stay at the hostel. A pleasant surprise was the breakfast spread they put on every morning which also came with some tasty baked treats prepped the night before - small touches go a long way! Would highly recommend it if you are in the Algarve for surfing, perfect base to search for waves. I loved this place so much. I’d definitely stay again. Amazing pool, great people. 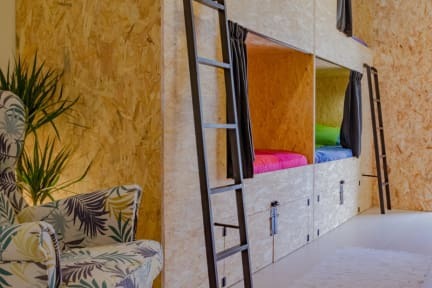 Dope hostel! Great brek, super clean, awesome people and atmosphere. Came here alone but always had company! Would recommend always, and surf lessons are a plus! We absolutely loved staying here!!! Had an awesome pool, pool table and table tennis and the lounge was suuuuper cosy with a fireplace! Even had the curtains to pull across your bed for extra privacy. The staff were also super amazing and we loved the free breakfast and the free packed lunch!!!! Best hostel I've ever stayed at - thanks Naomi and Tom!!! Great location, very close to a couple grocery stores & local restaurants, quiet residential area but walkable to all the highlights of Lagos. Excellent, engaging, helpful, friendly staff. Comfy beds & cute rooms (love the curtains on every bed, like a little cozy capsule). Nice pool. Delicious varied breakfast. Quite clean. Really homey, comfy feel, like you can just make yourself at home. Would definitely come back again!